Will Charlotte lose another cultural heavyweight? There was a time nearing the end of 2016 when N.C. Rep. Carla Cunningham decided to take a drive by the historic Excelsior Club, a trip that one could say marked the beginning of the end for the 72-year-old venue. Cunningham had inherited the deed for the club in 2010 from her husband Pete Cunningham after he passed away. Though she hadn't been inside in six years, she liked to drive by every once in a while and reminisce about Pete, or just check on the property. This drive-by was a shock for Cunningham, however, who found the grass growing long and the front door boarded up. It had been closed since June, and Cunningham hadn't heard a word about it. A few months later, on February 14, Cunningham filed for foreclosure on current owner James Ferguson, the heralded civil rights attorney who has owned Excelsior since 2006, after deciding that she could not continue to patiently wait for payments she said had been coming inconsistently for years. "I am a firm believer that past behavior is the best predictor of the future," she said. "And I had not seen anything that was showing me that there was going to be a change made." Now, as Cunningham contemplates her next move, the future of a club that served as a pillar of Charlotte's black community for 72 years is unclear. The Excelsior Club has hosted acts like Louis Armstrong and James Brown over its 72 years in existence. 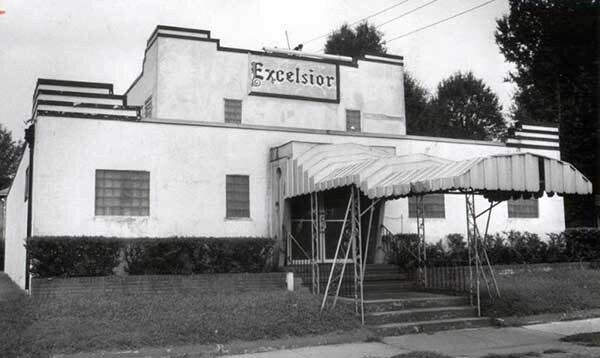 Excelsior Club opened in 1944 on Beatties Ford Road in Washington Heights, Charlotte's oldest black neighborhood. It's known as one of the longest-operating nightclubs in American history, black or otherwise. The club, like the neighborhood itself, catered to an up-and-coming black middle class. It soon became the place to be seen among the black elite, with performers like Nat King Cole, Louis Armstrong, James Brown and The O'Jays playing for the crowds over the decades. Excelsior served as a gathering place for black political leaders during the Civil Rights era, and as recent as last year remained an important stop for local politicians to pass through. In 2015, CL reported on the Early Voting Kick Off Rallies held there biannually by Ferguson and his goddaughter Colette Forrest, recently named chair of the Charlotte Black Political Caucus. Relatively recent celebrations of President Barack Obama's first and second elections were filled with an optimism that was not there on Feb. 22, when Forrest and Ferguson held a press conference to discuss the foreclosure. During the press conference, Ferguson said he took over the club reluctantly in 2006 as a favor to Pete Cunningham, and was faced with many hardships in his attempts to keep the business afloat. "During the more than 10 years that I have owned the historic Excelsior Club, my family and I have been met with both challenges and rewards," Ferguson said. "The challenges have been many, the rewards few." He acknowledged the broad support of the community over the years but admitted that the financial burden became to much. Ferguson said the club was originally closed last June in order to do renovations and upgrades, but it all became too much and the club was unable to open its doors again. "With our doors' closed, we were unable to meet the club's financial obligations, including mortgages, taxes and other obligations that we expected to meet. My family and I remain committed to doing all that we can do to preserve the club as an asset for the community, whether under our ownership or that of another." Standing behind Ferguson at the press conference was a conglomerate of community leaders, politicians and clergy members, many of whom want to make sure Excelsior Club remains a place the black community can rally around. 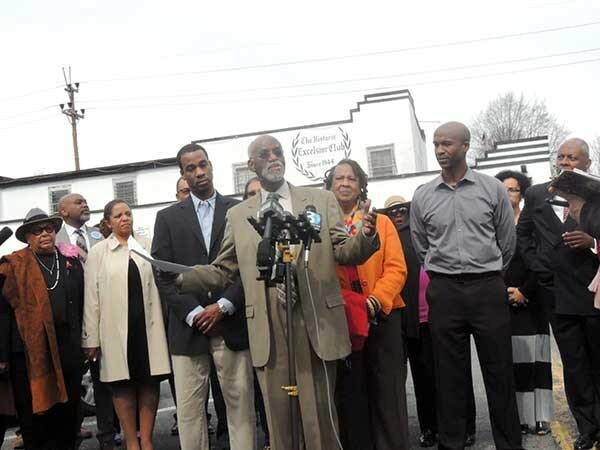 Current Excelsior Club owner James Ferguson at a press conference addressing the club's recent foreclosure. City councilman James "Smuggie" Mitchell spoke with Creative Loafing following the press conference, and recalled that when he was first elected to represent District 2 in 1999, he held his celebration party at Excelsior. "What the Excelsior has meant to me is grassroots effort with tremendous history," Mitchell said. "My mom and dad would tell me who performed here back in the early days, so I want to be a part of working to keep this legacy viable in our community." Standing with Mitchell was Al Austin, who currently represents District 2 (Mitchell returned to the council in 2015 to serve at-large), who said he wants to join Mitchell in offering his platform to help save Excelsior in any way they can. Austin said his grandmother grew up just down the road from Excelsior and attended functions there many years ago. His mother did the same, and so did he. "[Ferguson] talked about the next step, so I'm looking forward to seeing what that is so we can all rally around that to make something happen to save a part of our history," Austin said. "In Charlotte, we've gotten rid of the Good Samaritan Hospital, Second Ward [High School] — many of the communities were just kind of wiped out, so we need to save this part of Charlotte or it's going to be gone forever." The next step, however, appears to depend solely on Carla Cunningham, who has no intentions of halting the foreclosure process and expects it to take between three and four months. Once that's finished, she plans to analyze the needs of the building, as she's been made aware of multiple code violations that will need to be taken care of. Once that's done, she will have the property appraised and begin discussions with folks who are interested in either buying or leasing the property. Cunningham has mixed memories within the building itself. She and Pete held their wedding reception at Excelsior in 2006, and she still has some of the original lanterns from the club that were replaced during the last upgrades. However, later experiences do not hold the same nostalgia for Cunningham. She recalls the last time she went to Excelsior on New Year's Eve 2010. "It wasn't the type of environment that it was before. When I went back, I didn't feel as comfortable," she said. "I was wanded with a security wand. I was like, 'Whoa, this is not what I'm used to. My husband owned this place for years, and I'm the deed holder, and you're going to wand me?' I just never went back." Cunningham said her personal experiences with Excelsior Club, be they positive or negative, won't play a role in what she chooses to do next. She said she's optimistic that Excelsior Club will remain, although it may be more likely to survive as a historical site than the thriving nightclub it once was. "I'm not focused on it returning to its older days. I'm focused on retaining the historical preservation, as well as finding the right person that knows what I want to do, and to make sure that they will ensure that priority for historical preservation remains," she said. The club is designated a historic site by the Charlotte-Mecklenburg Landmarks Commissio, which gives it some protection from demolition, but ultimately its fate lies with the owner, whether that be Cunningham or a new buyer. "I'm very aware of the historical background. I recognize that it has been a pillar in the community for a long, long time. However, business changes every day. I didn't expect to be where I'm at, but this is where I'm at and I'm OK with it," she said. I want to assure the community that I'm taking them into account when I make these decisions, but I will be making a business decision. I will be looking at what I need to do for my family. I live today. "I do not want to have any regrets if I were to die tomorrow. And I hope that other people would think of it that way. I am going to do everything I can to get the place back up and running, but I'm not attached to it in that way that a lot of people think I'm attached to it, because my memories are of my husband, not of a place."